Pop: 12 in Yanakie village, 281 in whole peninsula region. Location: 186km S.E. of Melbourne. 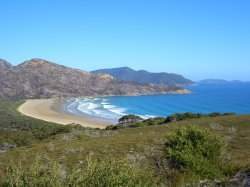 Yanakie village is located on the Peninsula that connects the mainland to Wilsons Promontory the southernmost landmass on the Australian mainland. Situated in a picturesque rural location overlooking rolling farmland, Yanakie is an ideal spot to stay and relax both before and after visiting the Prom. The beaches at Corner Inlet and Shallow Inlet are only a few minutes drive from Yanakie and are located on either side of the peninsula. Not only are they top fishing spots, but also great for swimming, bird watching, bush walking, photography or simply admiring the unspoilt spectacular scenery of this southern coast area. Boating (boat launching facilities at Shallow Inlet and Corner Inlet. 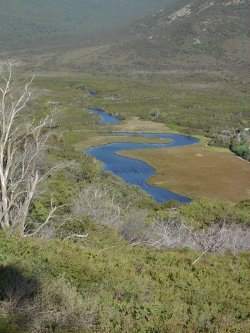 The Yanakie Landing - The track itself passes through typical coastal heathland, with stands of banksia, paperbarks, she-oaks and the occasional gum.Native orchids, correas, ferns and the prickly Yanakie berry shrub may also be found on either side of the track. After a few minutes walk a well-placed timber lookout offering panoramic views of the Inlet and the higher peaks of Wilsons Promontory appear. Beyond the lookout the track narrows a little and begins to descend towards sea level via a series of gentle zigzags. Fishing, swimming, bush walking, tennis. 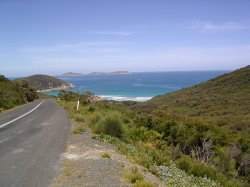 Wilsons Promontory - 3km south, Open: daily (entry fees apply).`The Prom is Victorias best loved national park - 50,000 hectares of Bass Strait beaches backdropped by granite mountains. 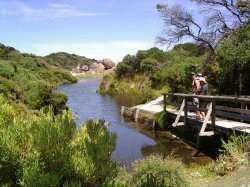 A network of 30 short to long walking tracks extend principally from Tidal River and lead to secluded beaches, coves and lookouts. Agnes Falls - 40 km east -The Agnes River drops 59 metres into a deep gorge, making Agnes Falls the highest single span falls in Victoria. The falls are best viewed from two platforms, only minutes walk from the carpark. Good picnic facilities are available in the 6 hectare scenic reserve.